My first contact with the 2016 Lexus LX 570 was at the 2016 Montreal International Auto Show. There sat a bit hulking SUV of incredible size offering incredible luxury to its occupants while overshadowing (literally) other cars in its immediate vicinity. In fact, during my show review, this SUV was highlighted as having one of the nicest interiors of any vehicle I’d ever seen. I was very anxious to see if the real-world driving experience would measure up to my first impression at the show. The exterior of this behemoth is unmistakably Toyota/Lexus with a Land Cruiser shape to it. Lexus’ signature spindle-shaped, open-mouth grille takes over the front fascia in its largest form. I mean the thing is just massive and is the most recognizable Lexus design trait. Most people I talked to have a love-it-or-hate-it reaction to the look and my opinion rests with the former. What’s interesting is that Lexus has managed to give the LX a combination of jagged and curvy design traits while still retaining that Land Rover boxy silhouette. The first thing you’ll notice when sitting inside the vehicle is its massive size. The centre console is probably a foot and a half wide and adorned with buttons and switches that would make an airline pilot jealous. The materials are of the highest quality and I’d expect nothing less from Lexus. The leather is soft, plentiful and pleasing to the touch. Plush wood paneling can be found on the dash, console and parts of the steering wheel to offer a visually appealing contrast. There is seating for eight occupants so large families who want to stay away from minivans will be right at home here. Where Lexus stumbles quite heavily is its infotainment system. This critical part of the vehicle should be easy to learn and a breeze to use, but unfortunately it’s none of those things. The system is controlled by way of a laptop-style track pad on the centre console which manipulates a cursor on the screen. Rather than a standard menu system, you’re stuck in a 360-degree plane trying to hover the cursor over the correct function. Often times you think you’ve got it only to have the cursor jump to some other button when you attempt to press it. It’s incredibly frustrating to use and particularly dangerous to operate while driving. One of the reasons why I was excited to test the 2016 Lexus LX 570 was for the in-car entertainment system. I’m looking to replace my 2011 Caravan with an SUV or pickup, but few come with TV screens available as a factory option and I’m afraid this is a must-have for my gadget-addicted offspring. The LX comes standard with dual screens behind both front seats and even earphones so that the little ones can listen to their cartoons without bothering mom and dad up front. It’s a very neat setup that would work well for my three boys should we decide to ditch the minivan. Driving the LX 570 wasn’t as pleasant as I had expected. People might describe it as an SUV, but in reality this is a full-blown truck. This fact becomes readily apparent immediately after the starting the vehicle and hearing the deep-throated rumble reminiscent of something as large as a recycling truck. Generating all that noise is a 5.7-litre V8 engine making 383 horsepower. As you probably expected, fuel economy isn’t stellar, coming in at 19 L/100 km with mainly city driving. If you’re looking to pull your boat, the vehicle has a 3175-kg (7000-lb.) towing capacity. Handling and braking are equally truck-like and the pedals and steering wheels require more effort to manipulate than I anticipated. I was expecting a nice, quiet effortless glide, but too much effort was required in order for it to be characterized as comfortable. To make sure it wasn’t just me, I asked my wife to take it to the corner store and she came to the same conclusion that the LX wasn’t a relaxing drive. 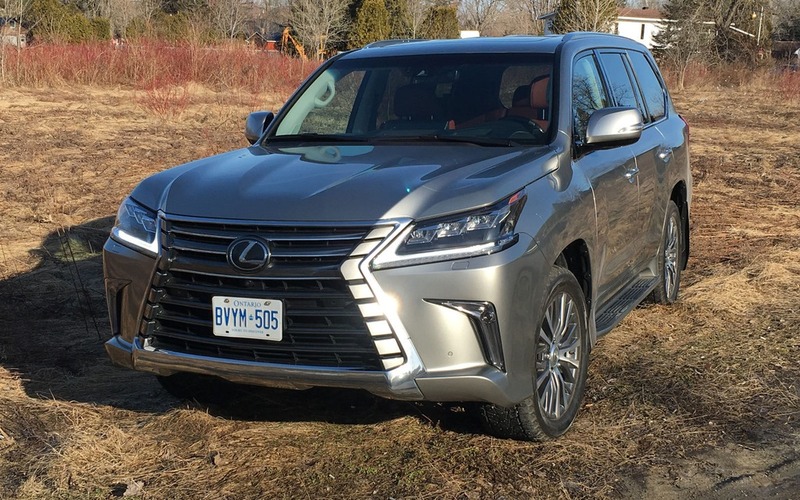 Starting at a whopping $107,440, the Lexus LX 570 represents the top-of-the-line flagship product from the Japanese automaker. There are no options available as it comes in only one form with every feature already installed. Lexus reasonably assumes that if you’re in the market for a $100K-plus SUV, you’ll probably be taking the fully-loaded version anyways. I feel the LX 570 will appeal to people who are really looking for a different type of truck to stand out with compared to all of the BMW, Mercedes-Benz & Range Rover SUVs that make up the bulk of the luxury market. If you can get past some of its shortcomings, I’d say it accomplished this feat quite nicely. 4/10	Bad but probably not a concern for the target market. 6/10	Sluggish handling, acceleration and braking. 4/10	Lexus needs to fix this. 6/10	Great truck to stand out from the crowd.